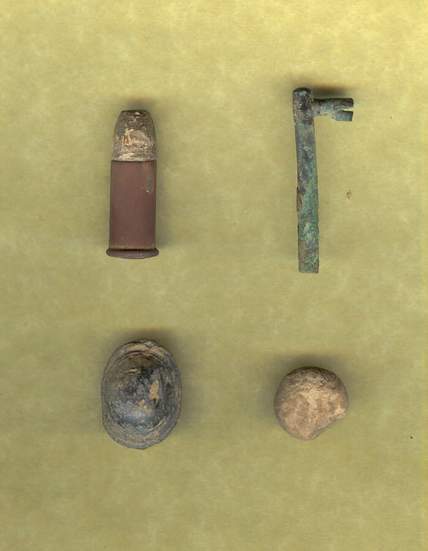 Some of our 2011 Finds- the First Pic is a group of Bullets Roman and I found at a camp near Vicksburg. In that group, we dug some super Rare Multi-Ring Sharps. 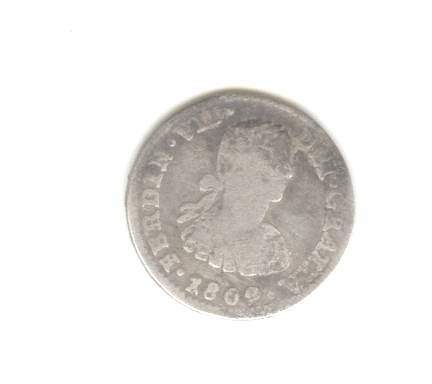 The 2nd Pic is a 1851 New Orleans Half Dime I found at a LA Plantation. Roman dug his 1st US Eagle Breastplate in 2011. 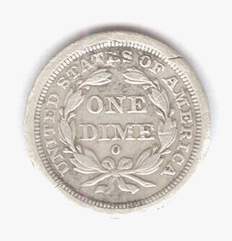 Then he found his 1st Large Cent. 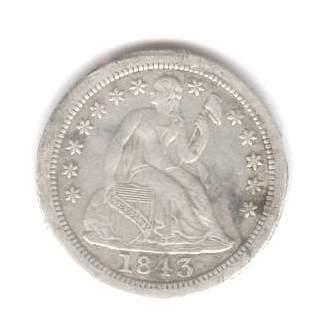 On December 10th, 2011 while hunting a Union Camp near Vicksburg, I dug a Rarity 9+ 11th Wisconsin Token which was picked as one of the Best Finds of 2011. 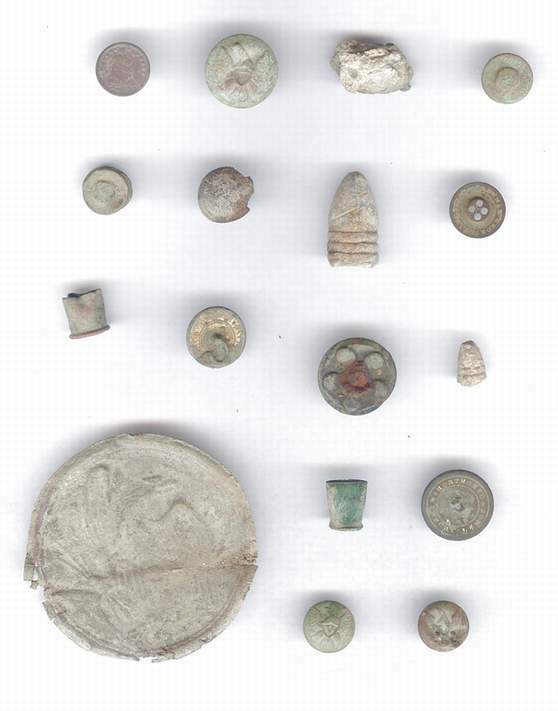 The last pic is some of Romans better Buttons he dug in 2011. 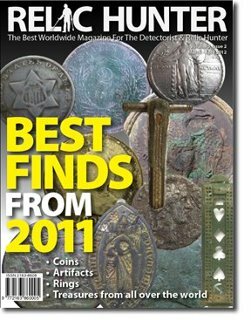 April thru December 2010 Finds- I found a 1854 St. Mary's Pendant & Unique Carved Bullet at a LA Plantation. 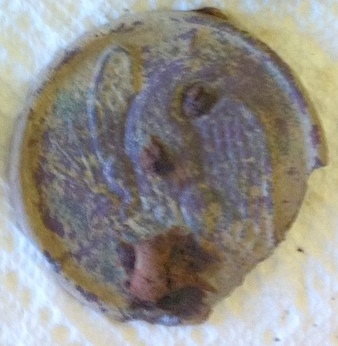 While hunting near Vicksburg, Roman dug a sweet Mississippi Button. 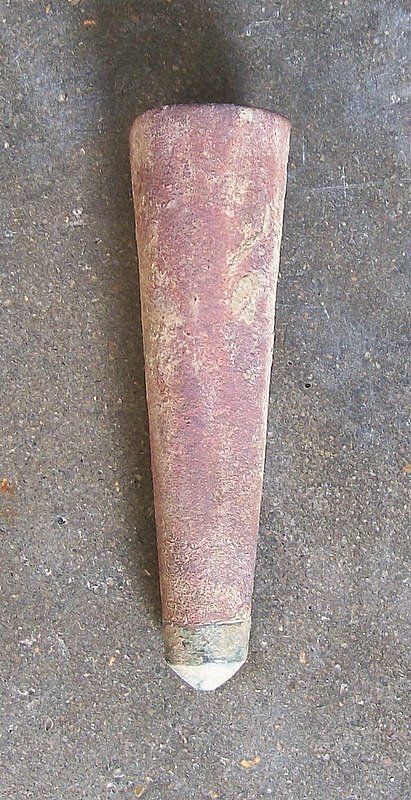 At another camp near Vicksburg, I found a nice CS Scabbard Tip. In a Union Trash Pit near Edwards, I dug several Overcoat Size Union "A" Buttons with cloth still attached. 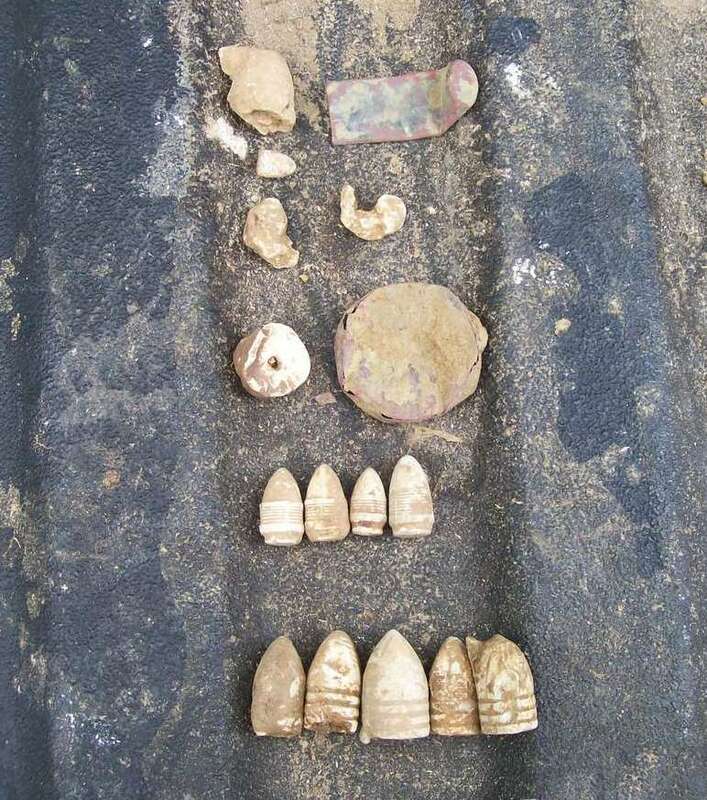 On March 12th, 2010 I was hunting a US/CS occupied Camp near Vicksburg and found a hole full of Bullets, one Eagle Button, and a Large "Clip Point" Bowie Knife. This Knife is wicked looking and would of been a very intimidating weapon back then. It's 16 inches long and has the classic Jim Bowie style. I have wanted to find a large Bowie knife for 26 years and now I can cross it off my list of relics I want to find. April 4th, 2009 is a date I will never forget. James Fox and I were given permission to hunt the Kain Plantation in Vicksburg, MS. The weather was perfect- one of those days with a slight breeze, sunny, and not too cool, just right for hunting. I was hunting by the sidewalk on the north side of the house when I got a clear, crisp, deep signal. 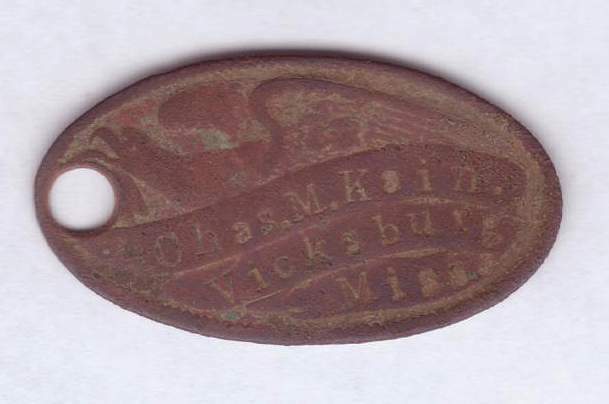 I could not believe what was in the bottom of the hole- a Rare oval ID Tag with an Eagle/Chas. M. Kain/Vicksburg, Miss on the front. Instantly, I knew this was a member of the original owners of the house but I did not know if he was a significant member. 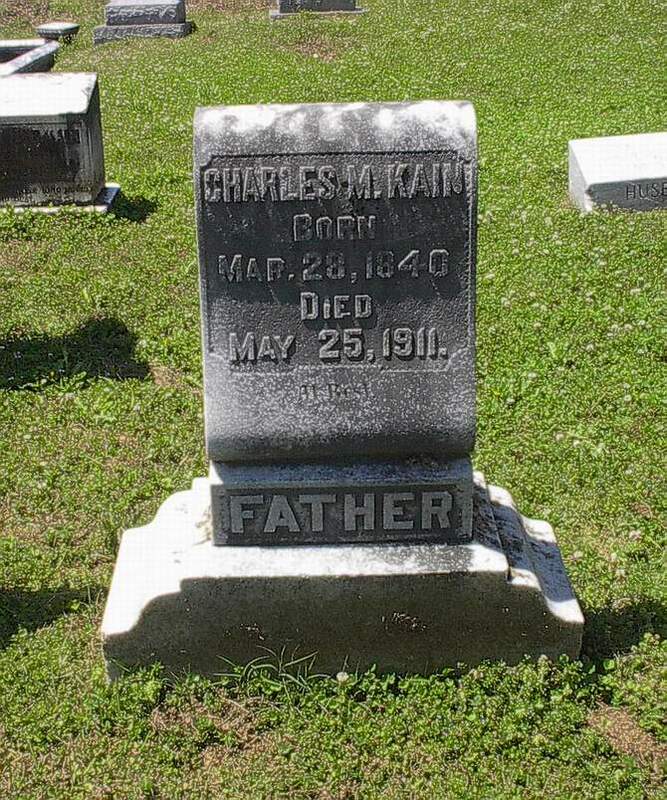 Imagine my surprise to find out later that he was not only a prominant Vicksburg citizen but also a Confederate Soldier in the 48th Miss. Infantry which had a glorious history during the Civil War. The current landowner and myself decided this Rare Relic should be in a Museum so on April 14th, 2009 I donated Mr. Kains' ID Tag to the Old Courthouse Museum in Vicksburg, MS.
Below are pics of the plantation, location of the find, the Kains' graves, and Mr. Kain's ID tag. Due to work & family responsibilities, my group only hunted a few more times the rest of 2008. 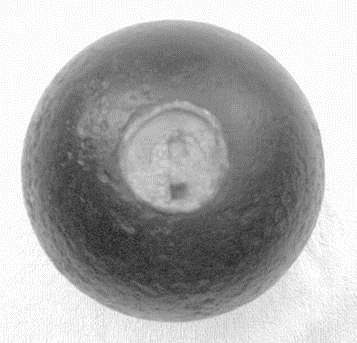 On March 28th, 2008 I found a complete Henry Cartridge, Friction Primer, Musketball, and a Pewter Pommel Cap for a Side Knife. On December 4h, 2008 I found a US/CS used Voltiquer "V" Button. March 15th, 2008 Relic Hunt- I revisited 3 old sites that yielded some good finds in the past. Today they gave up a few more nice relics. The first find was a Navy Button, shortly after that I dug this unique Gold Bull, and then this Union "C" Button came out at the end of the day. All 3 relics were found with a Red Heat XD-17 Detector. March 22nd, 2008 Hunt- I went back to a pounded site with the Red Heat XD-17 and dug my 12th Voltiquer "V" Button. Found on private property with permission. February 24th, 2008 Relic Hunt- I went to a house site that has yielded some nice relics in the past. One area has been avoided due to bob wire so I figured that might give up a good relic. 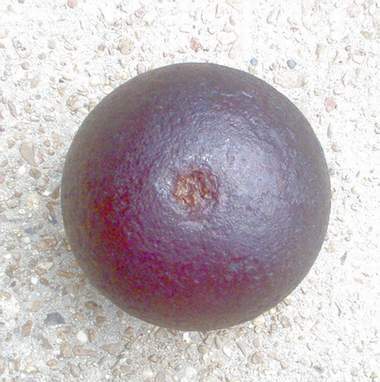 I dug a long strand of wire and still got a strong signal in the middle so I dug down and much to my surprise popped out a real nice CS 6 Pound Solid Cannonball. 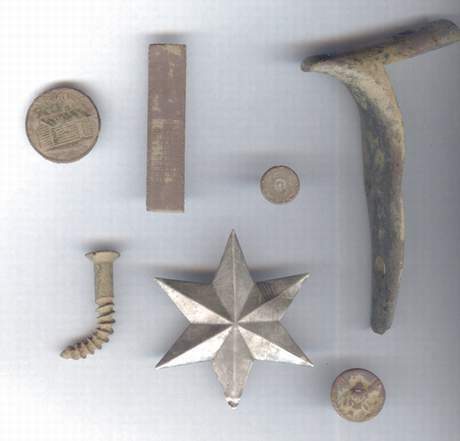 September 23rd, 2007 Hunt- pictured below are my finds from a Plantation Site North of Vicksburg. I found these relics right behind the old Cistern. 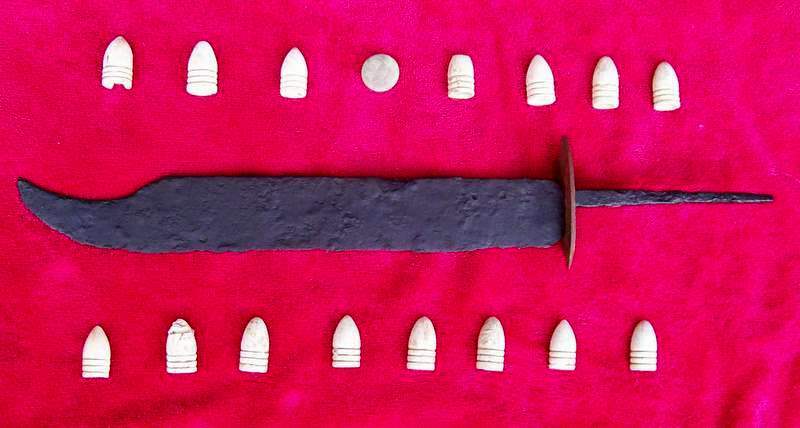 My finds that day were a Springfield Bayonet with "US" still visible, 2 fired bullets, and a Rare Bavarian Sharps Bullet. Found on Private Property with Landowner's permission. Detector used- Red Heat Micro XD-17. 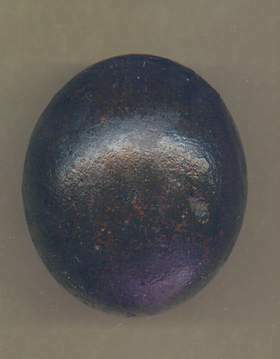 September 22nd, 2007- while hunting a Plantation Site near Vicksburg I dug a coat size US Dragoon "D" Button which is loaded in Gold Gilt. Found on private property with landowner's permission and using a Red Heat XD-17 Micro Detector. This button is in the July-August 2008 Issue of American Digger Magazine. March 7th, 2007- I dug a coat size CS "A" Artillery Button with a Local B/M. This is the best one I have ever found. It is in perfect condition with a stand up shank, no pushes or even one scratch. 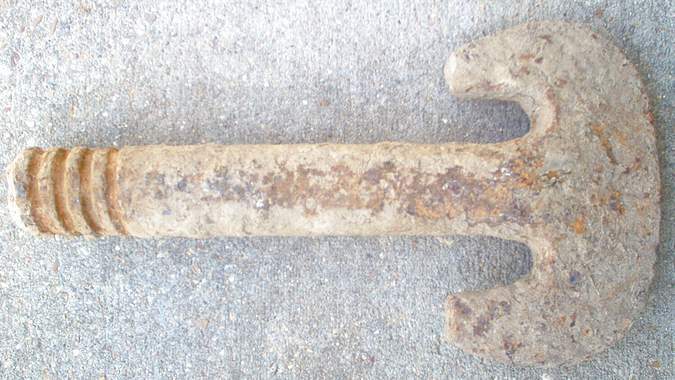 The next day(March 8th, 2007) I found a US Eagle Breastplate with two solid iron hooks, full lead, and a nice face. On April 15th, 2007 I went back to this same area and found a Star Hat Pin. These were worn by Mississippi & Texas Troops. 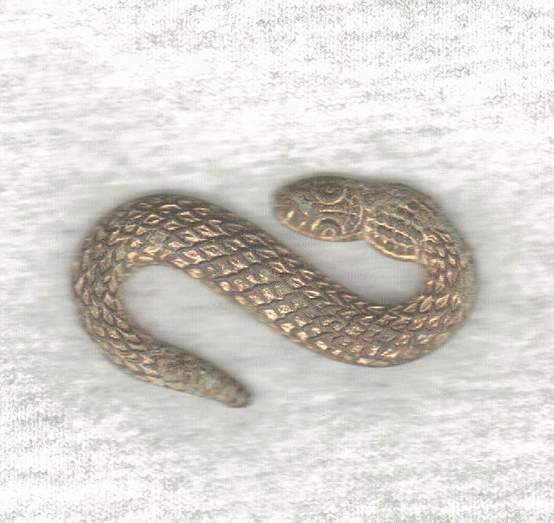 It could of been used by them as a Hat Pin or as part of their Buckle. Mine appears to have been used as a Hat Pin. All three relics were dug in Central MS on private property with permission. They are in the "Field Recoveries" Section of the Jan/Feb 2008 Issue of North-South Trader Magazine. We have been in a nice US/CS occupied camp this year. Here's three nice and seldom seen relics dug by two friends in that camp. 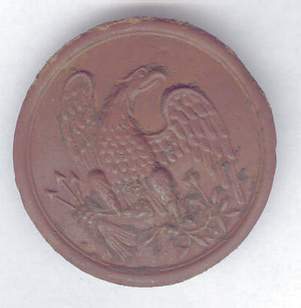 Lamar dug the Early Militia Mississippi Button and the Union Eagle Breastplate that was struck. A 44 caliber roundball fits perfect in it. Woody dug the CS "A" Artillery Button with a Richmond B/M. 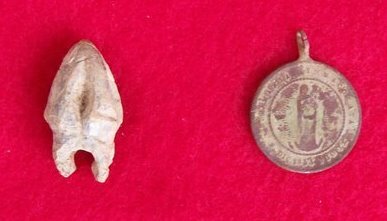 All three relics were found in March 2007 in Central MS on private property with permission. Recent Button Finds, both were a first for me. I dug the Union Rifleman "R" Button on Feb. 28th, 2007. Fortunately, it is loaded in Gold Gilt and has a shank. It's in the "Field Recoveries" Section of the Jan/Feb 2008 Issue of North-South Trader Magazine. I found the Connecticutt Button on December 16th, 2006. It also is loaded in Gold Gilt and has the shank. Both were found near Vicksburg on Private Property with Permission. The "R" Button was found with a Shadow X5. 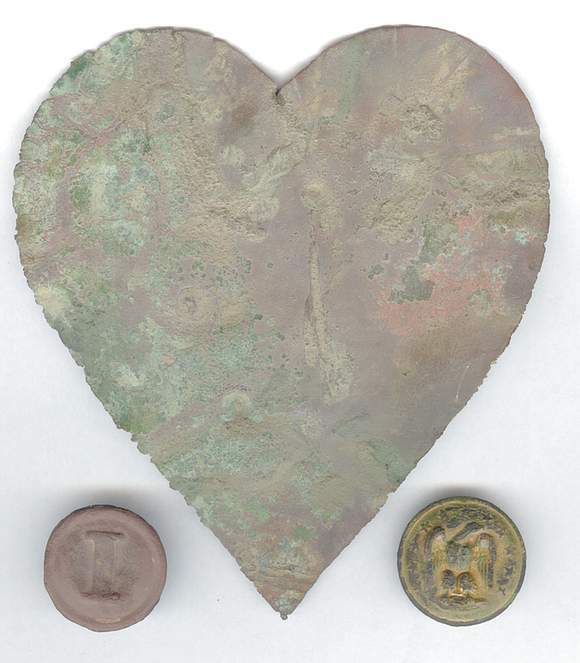 The Connecticutt Button was dug with a Minelab X70. Feb. 17th Relic Hunt- I have seen a-lot of Artillery relics but had no clue what this was when I found it. Pete George and Mr. Tulloh(Artillery Collector) solved the mystery. It's an Artillery Jack for a Cannon Sling Cart. Used to raise & lower Cannons. The Sling cart made moving a Cannon into position much easier. Found in an Arkansas & Alabama Artillery Camp. Dug on private property with permission. Machine used- Shadow X5. Pictured below are some of my finds from November 2006. The first pic is my finds from November 26th. 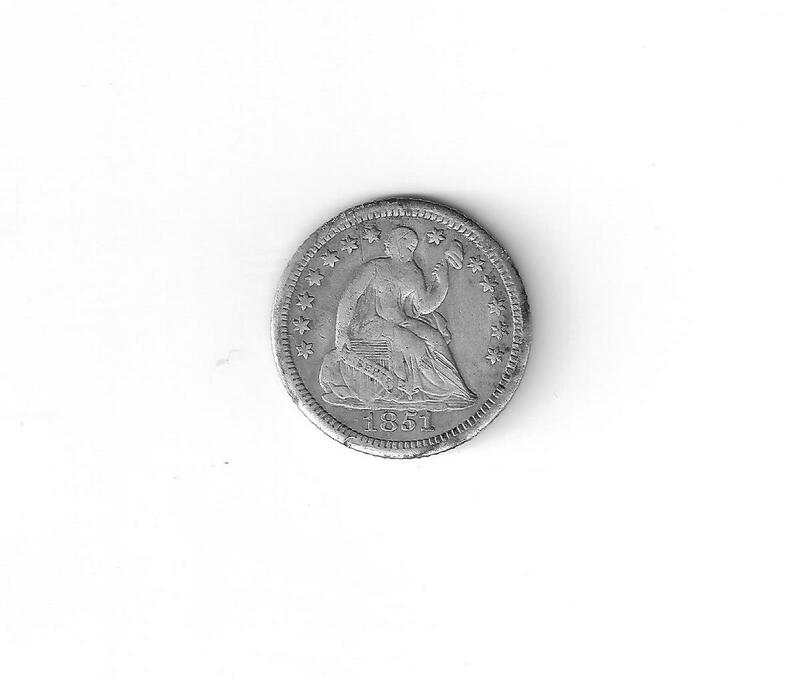 The second pic is 2 Voltiquer Buttons and a 1853 New Orleans Half Dime which were all dug in November. Both "V" buttons are in excellent condition with shanks. I have recently come across more History on the Voltiquers which make these buttons even more special to me. The "Voltigeurs" were a "special forces" unit that used light mountain howitzers, and Hale's rocket launchers during the Mexican War! Capt. R.E. Lee, and Joseph Johnston, both served with the "Voltigeurs". Interesting fact, is that the Voltigeurs wore a special uniform that was light grey in color, as opposed to the dark blue of the other uniforms. Coincidentally, these future great Confederate generals donned the "grey" a full decade and a half before the onset of secession! Dug on Private Property with Landowner's Permission. Machine used- XTerra 70. Finds made by Friends in November 2006. 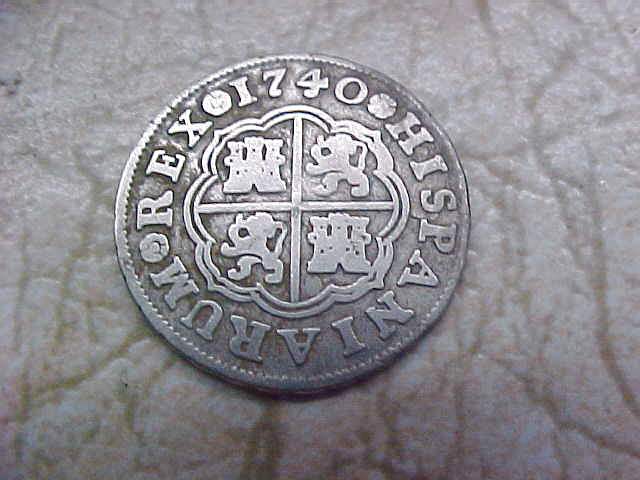 From left to right: Woody Cox found this nice 1740 Silver Spanish Coin. Hard date to find around here. 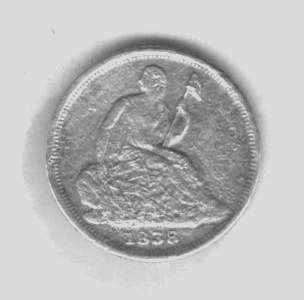 James Fox dug the1809 Spanish Coin at the same site. Lamar Cannon dug this Gold Gilted Snake. Congratulations guys on these nice finds in November. Relics found with White's XLT, White's Prizm 4, and XP Goldmaxx. All relics found on Private Property with Landowner's Permission. 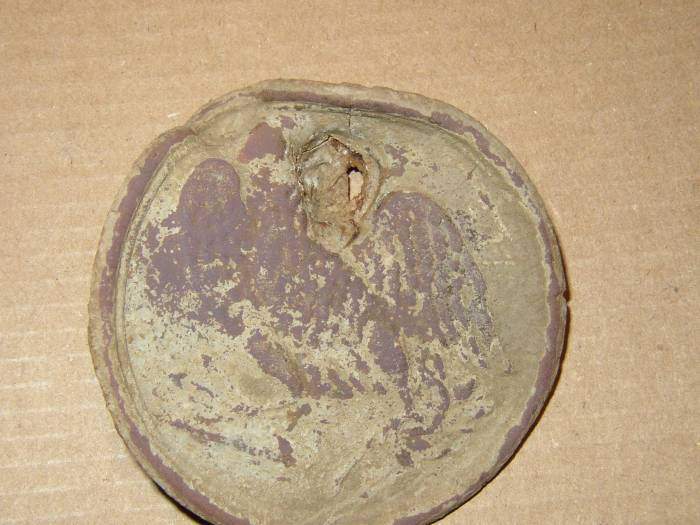 In September 2006, I dug these two CS Artillery Buttons with brass backs near Vicksburg, MS. They are huge buttons. One of the buttons has a Richmond B/M. Relics found on Private Property with Landowner's Permission. Machine used- Minelab XTerra 70. On September 30th, 2006, James Fox found one of the best New Orleans Half Dimes I have ever seen dug. It's an 1857 Seated Liberty Half Dime and looks like it was dropped yesterday. Everything is clear as a bell. 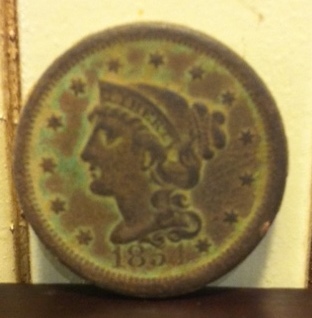 Here's a pic from my scanner but it doesn't do this coin justice, it is in incredible condition. Congratulations James. Dug on Private Property with Landowner's Permission. Machine used- White's Prizm 4. 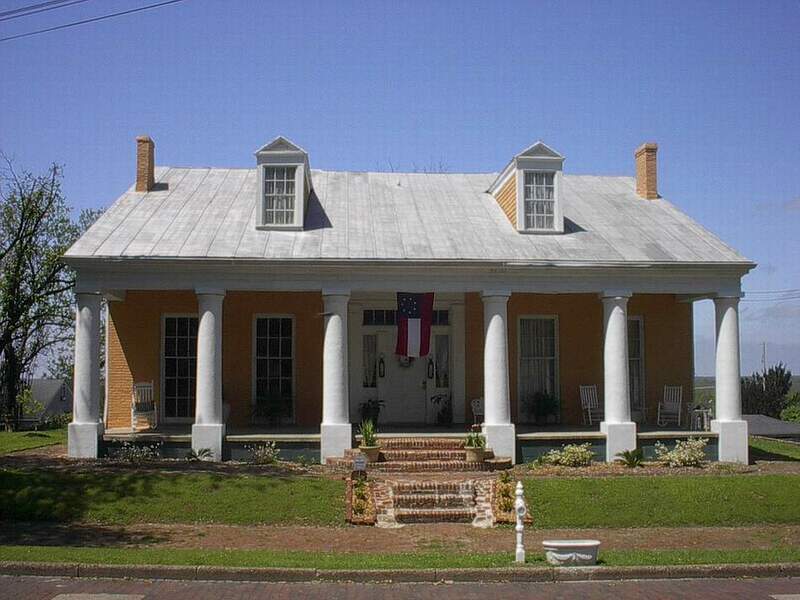 On August 25th, 2006, James Fox and I went to Vicksburg to re-stock the Corner Drugstore Museum. Afterward, we had 3 hrs to burn so we hunted a field were a Plantation once stood. 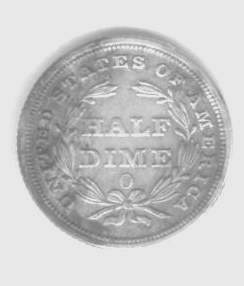 I dug an 1840 New Orleans Seated Liberty Half Dime. 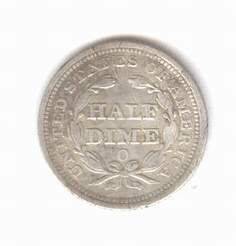 Shortly after I dug the New Orleans Coin, I heard James holler. I went over to him and saw a US Eagle Breastplate in his hand. This was James 1st US Plate. Congratulations James, hope to see you dig many more. Dug on Private Property with Landowner's Permission. Machine used- White's Prizm 4. The 2006 Relic Hunting Season has started off very well for me. 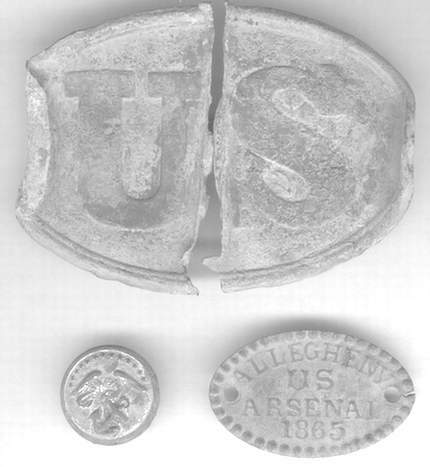 In a 3 week span(Jan. 18th thru Feb. 4th) I found 3 Overcoat Union "I" Buttons, an 1862 Indian Head Penny, 1854 Silver Dime, a Wellington/Waterloo Button(commerates defeat of Napoleon), a CS Staff Officer Button with an iron shank, and a Rarity 9 CS "Leech & Rigdon Smooth Wreath. Pictured in the July/August 2006 Issue of American Digger Magazine in the "Just Dug" Section. Dug on Private Property with Landowner's Permission. Pictured on the Front Cover of the Jan. 2006 Issue of American Digger Magazine and in the "Just Dug" Section. Dug on Private Property with Landowner's Permission. second one I have ever found. 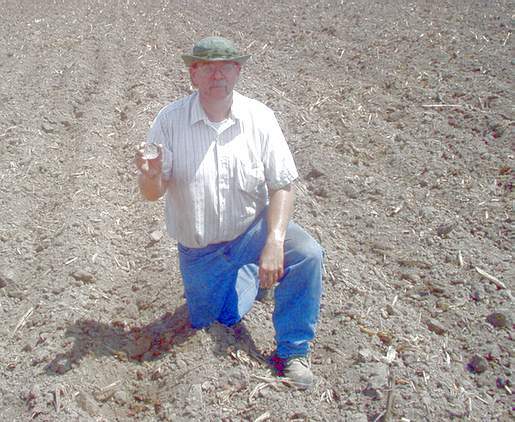 Pictured in the "Just Dug" Section of the Jan. 2006 Issue of American Digger Magazine. 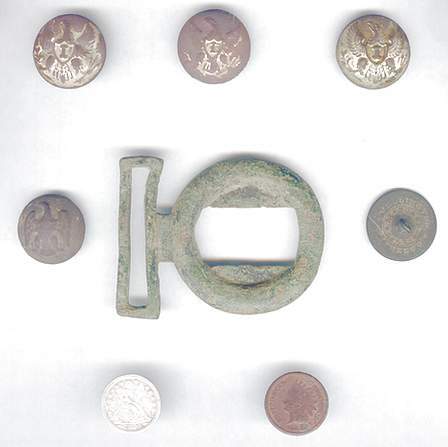 The Relics in the pic below were found by me near Raymond, MS. in the Spring of 2005. 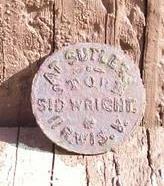 The unique CS Martingale and the Rare CS Staff Officer Button were found in the same hole about a foot apart. The CS Staff Button is very scarce(CS 36), usually worn by a CS Major or higher. The CS Martingale has soldered on brass hooks just like many CS buckles. 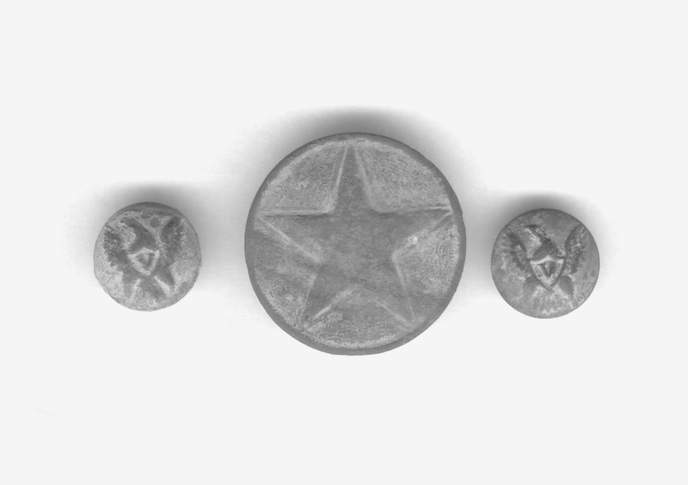 The CS Infantry Button was found close to the CS Martingale and CS Staff Button. Pictured in the "Just Dug" Section of the Sept/Oct. 2005 Issue of American Digger Magazine. Here are some more of my Spring 2005 finds. 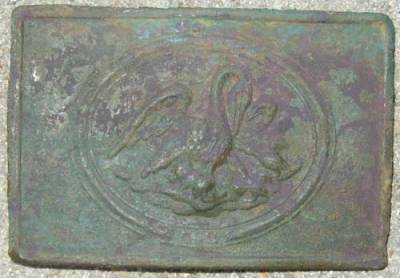 The US Buckle was hammered in half by a Soldier and snug shut like a clam, I unfolded it. The Marine Button has 60% Gold Gilt and a Scovill MG Co backmark(early 1850's), and a US Allegheny Aresenal Saddle Shield. 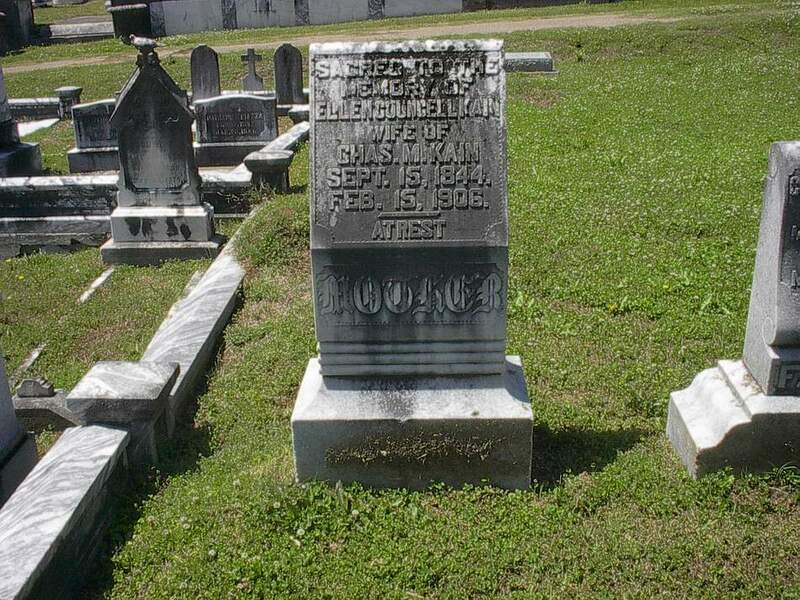 All 3 relics were dug near Vicksburg, MS. Dug on Private Property with Landowner's Permission. 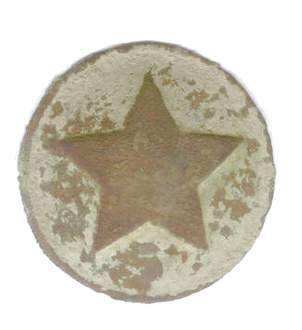 The Pic below is a Star Hat Pin and 2 "V" Voltiguer Buttons, all found close to each other. 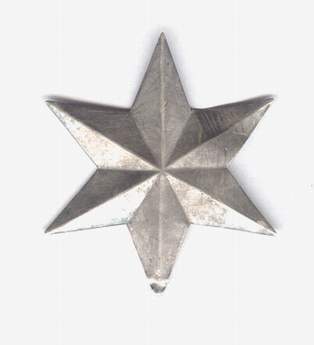 The Texas Star can be used as a Hat Pin or part of a Buckle. It has 2 small solder marks so I believe this is a Hat Pin. Texas troops, VA troops, and Louisiana Troops camped at this site. 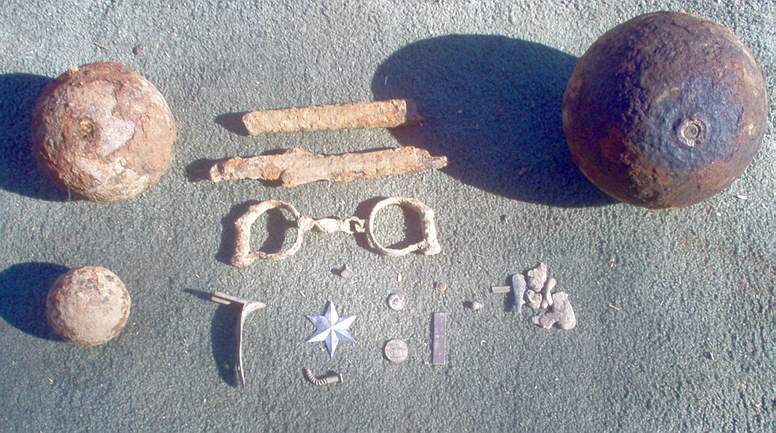 I dug these relics near Vicksburg, MS in Spring of 2005. Dug on Private Property with Landowner's Permission. 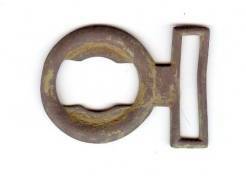 While hunting a Louisiana Camp in 2004, Lamar Cannon dug these two CS Buckles. 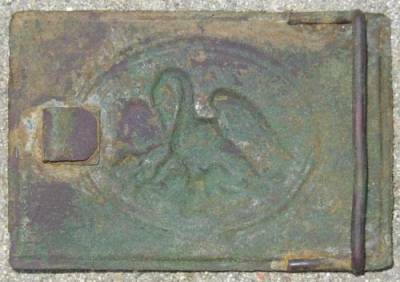 The first buckle he found was a scarce New Orleans Louisiana buckle which is Rarity 8. The second buckle was only 15 yards away from the other one, it's a plain CS Wreath that goes to a two piece Louisiana Buckle. Dug on Private Property with Landowner's Permission.